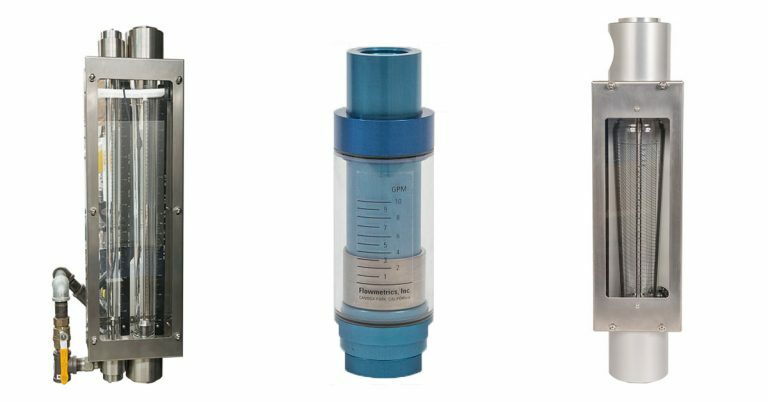 VARIABLE AREA FLOW METERS are frequently used in military, aerospace, chemical, petrochemical, water treatment, and waste treatment industries. The Series 2000 Variable Area Flow meter is a rugged industrial flow meter available in a wide range of liquid and gas flow rates. The Series 2000 family includes flow meters with scale lengths of 150mm and 250mm, providing accuracies to ±1% of flow rate. Materials of construction are available for the most corrosive process applications. The Series 2600 (Single Stage) and the Series 4600 (Multi-Stage) 600mm flow metering panels offer the highest precision available in our product line of variable area flow meters. The Variable Area Flow meter line has available capacities. of 2.8 cc/min up to 180 GPM for liquid or 100 cc/min to 750 SCFM for gas. Suited for temperatures up to 250°F / 121°C, the variable area flow meter line can be mounted in-line or as a panel installation. Connections are available as NPT or MS and Vertical/ Horizontal Flange. The variable area flow meter series has a standard calibrated accuracy of ±2% full scale for the 250mm meter and ± 1% rate for the 600mm meter. Optionally, the 600mm meter is available with ± 0.5 % rate accuracy. Length of the flow meter varies by series and model. 150mm (Model 2150); 250mm (Model 2250); 600mm (Model 2600). Graduation is shown as a direct reading on detachable scale with millimeter graduation on tube. Click the links to download the product brochures. The Flowmetrics 2000 Series Variable Area Flow Meter is a rugged industrial Flow Meter available in a wide range of liquid and gas flow rates. Horizontal end fitting rotateable in 90° increments. Heavy duty shields; front & rear. Clean-out ports; top and bottom (horizontal end fittings). Panel or in-line mounting hardware (included with each meter). Direct reading scales are engraved for each application. Heavy gauge steel frames with corrosion resistant epoxy paint. The Flowmetrics 600 mm Single Flow Metering panel offers the highest precision available in our product line. Each meter is provided with a direct-reading, custom-engraved scale mounted adjacent to the metering tube. Flowmetrics’ scales are generated from data obtained in calibrations using fluid which simulates as closely as possible the customer’s process. Click the link to download the Series 2600 brochure. 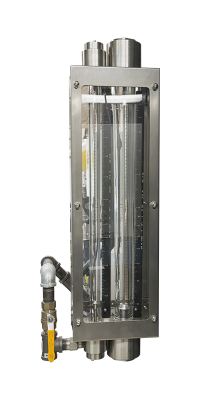 The Flowmetrics 600 mm Multi-Stage Flow Metering panel offers the highest precision available in our product line of variable area Flow Meters. Each meter is provided with a direct-reading, custom engraved scale mounted adjacent to the metering tube. Flowmetrics’ scales are generated from data obtained in calibrations using fluid which simulates as closely as possible the customer’s process. Click the link to download the Series 4600 brochure. Flowmetric’s in-line Flow Meter is simple to install and can be installed directly into horizontal or vertical lines. Click the link to download the Series 3000 brochure.